Working on my new app, Pocket Color Wheel I learned how easy to use native iOS tools to draw various shapes. For another app I’m working on, I wanted to draw clockwise and counterclockwise spirals. In this intermediate Swift tutorial I’m going to show you how to use a CABasicAnimation core animation and a CAShapeLayer to draw two spirals. First, refresh your memory on how to draw a golden spiral here. Second, this core graphic tutorial on Ray Wenderlich’s website has an excellent description how to draw arcs and describes some of the geometric conventions in Swift. This app is designed to run in landscape orientation. The center of the spirals is not hard coded, I’m using auto layout. The starting point for the center of the first spiral is set to the 1/3 of the width of the view. For the second it is 2/3 of the width. The initial radius is very small, 1/90 of the view width. The spiral path consists of 9 arc segments. As the path progresses the radius of each segment increases by 50%. The coordinates for the center shift for every π/2 to match the starting point of the new arc with the end point of the previous arc. Finally, the position of the spiral moves to the last center point, close to the mid height point of the screen. Drawing a counterclockwise spiral is done in a similar way. Only it’s done in the opposite direction. The animation draws the defined spiral path from the starting point 0.0 to 1.0. And there you have it! For your reference, you can download the complete Xcode project here. Go ahead, tweak the colors, curve paths, animation duration to suit your needs and ideas. 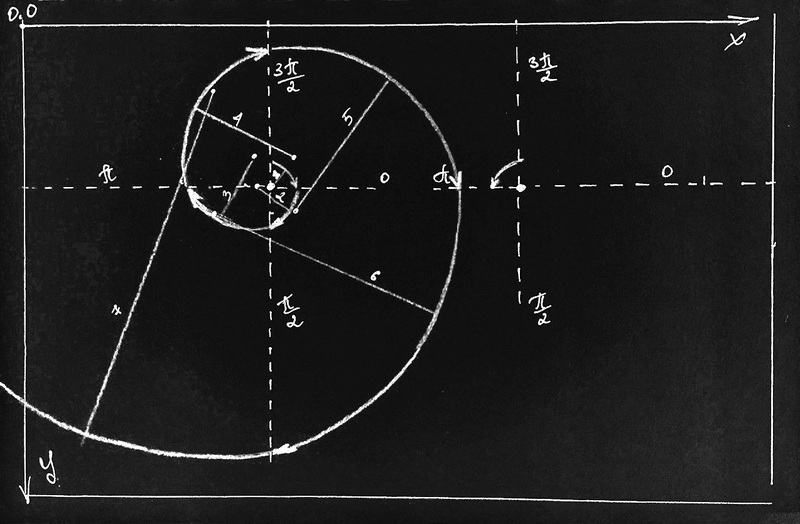 Try drawing a logarithmic spiral. 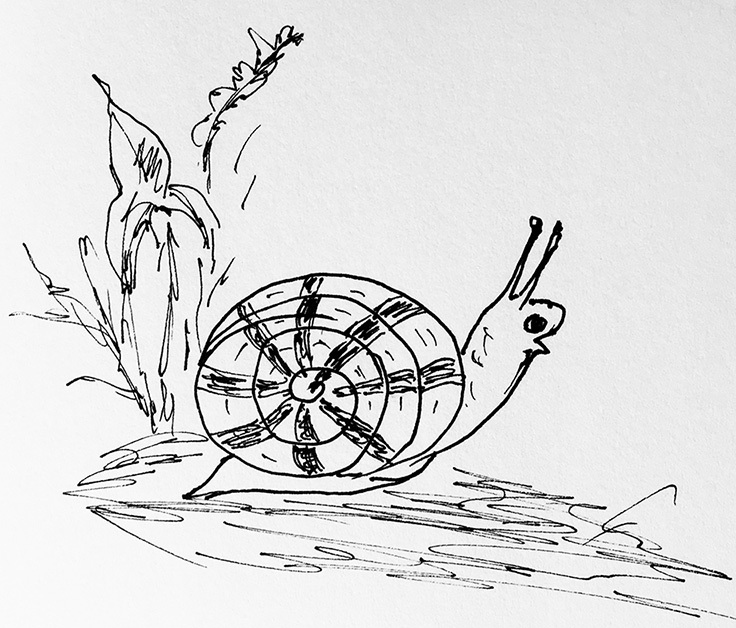 Perhaps you can take it further and even draw a snail. How cool would it be! Hi, Rumiya. I’m Gi-won Seo from Korea. Can I ask you one quick question? The Euclidean geometry graphic you put is really cool. How did you do it? By any chance, is it a work from an electronic note-taking gadget? I’d like to know because I’m recently inclined to buy an electronic note-taking gadget. Those graphic tools provided on the web doesn’t allow spontaneous drawing. If you used another tool, could you tell me what it is? Hi Gi-won, no, I didn’t use any gadgets. If you are interested in how it works, feel free to read the tutorial.